MTN Group’s C-suite— President and CEO Robert Shuter, Chief Human Resources Officer Paul Norman, and Chief Financial Officer Ralph Mupita—explain how MTN is enabling the best customer experience by enabling the best employee experience. Its global EX strategy includes performance management, onboarding, and agile learning supported across all functions and levels of the company. ​What creates a positive, motivating experience at work? Mainly, it’s the meaning and growth people find in the work itself—and to improve that, the entire organization has to be involved. Organizations are investing in many programs to improve life at work, all focused on improving the day-to-day experience workers have. While there is much that can be done to improve work/life balance, research shows that the most important factor of all is the work itself: making work meaningful and giving people a sense of belonging, trust, and relationship. We believe organizations should move beyond thinking about experience at work in terms of perks, rewards, or support, and focus on job fit, job design, and meaning—for all workers across the enterprise. 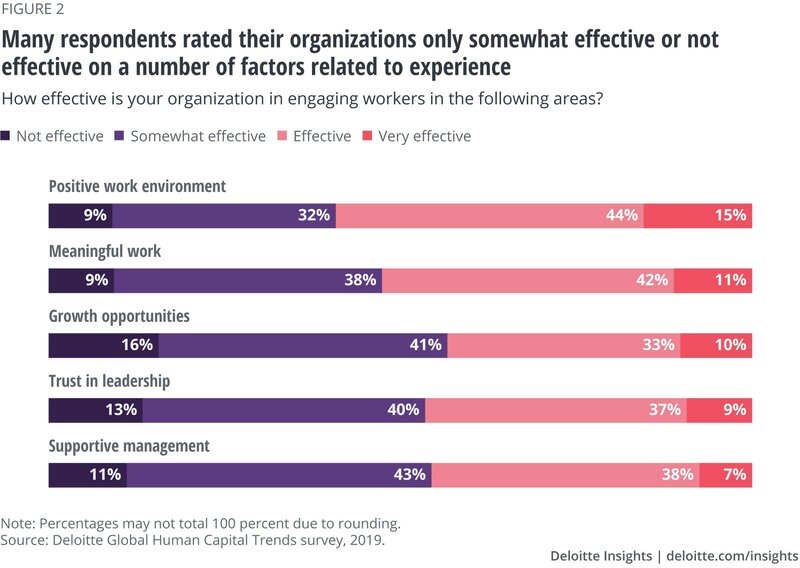 One of the biggest challenges we identified this year is the need to improve what is often called the “employee experience.” Eighty-four percent of our survey respondents rated this issue important, and 28 percent identified it as one of the three most urgent issues facing their organization in 2019. It’s hard to question why: MIT research shows that enterprises with a top-quartile employee experience achieve twice the innovation, double the customer satisfaction, and 25 percent higher profits than organizations with a bottom-quartile employee experience.1 Yet as important as it is, only 9 percent of our respondents believed they were very ready to address this issue, making it a massive priority for organizations around the world. Over the last five years, issues related to productivity, well-being, overwork, and burnout have grown.2 The digital, always-on world of work has been challenging for people (as we discussed last year and in 2014), and organizations have become increasingly concerned. And based on the results from our study, it’s clear that those issues have resulted in significant dissatisfaction with the job itself. This year, we found that only 49 percent of respondents believed that their organizations’ workers were satisfied or very satisfied with their job design. Only 42 percent thought that workers were satisfied or very satisfied with day-to-day work practices, only 38 percent said that they were satisfied or very satisfied with work-related tools and technology, and only 38 percent thought that they have enough autonomy to make good decisions (figure 1). And when we looked past the attributes of the individual job and toward the overall work environment, the results were still mixed. Only 53 percent felt their organizations were effective or very effective at creating meaningful work, and only 45 percent thought that they were effective or very effective at delivering supportive management. Fifty-nine percent thought that their organizations were effective or very effective at creating a positive work environment, but only 43 percent thought they were effective or very effective at providing the right opportunities for growth. When asked about their workers’ trust in leadership, only 46 percent rated their organizations effective or very effective (figure 2). Overall, it is clear that the employee experience has a long way to go. However, as we’ve learned about the employee experience over the last few years, several new concepts have become clear. First, employees are different from customers: They have an enduring, personal relationship with their employers, unlike customers who can stop buying an organization’s products at any time. Second, the employee experience is social: It is built around culture and relationships with others, moving well beyond a focus on an individual employee’s needs. And third, and most relevant to the issue at hand, employees want more than an easy set of transactions; they want a career, purpose, and meaning from their work. In order to create an enduring relationship, be social in nature, and create meaning, experience must come from and be focused on the individual. And that’s where prior attempts at addressing this issue have fallen short and where a future path can be forged. 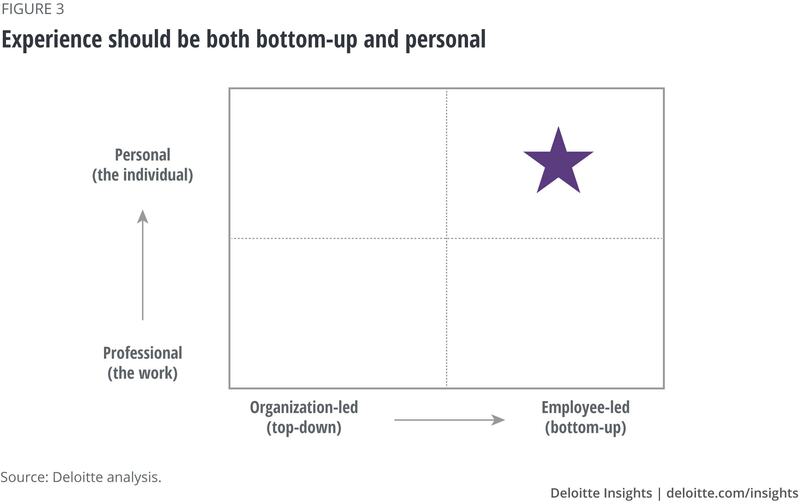 When experience comes from the individual (bottom-up), it is designed starting with the employee’s preexisting tendencies to enable them to do their best work in the way that works for them. When experience is focused on the individual (personal), it is designed to incorporate all of the psychological needs that must be met in order for someone to perform their work well. At the intersection of both is where the optimal experience can be found—something that few, if any organizations, have yet to achieve (figure 3). When applying this framework to the way in which organizations have tried to address the concept of experience in the past, it becomes easy to see where both prior and current efforts have fallen short. Work/life balance, which one could argue was the organization’s first attempt to create “experience” in the workplace, was designed by organizations to recognize that individuals needed to carve out time allocated to work for other aspects of life. Not only was it a top-down attempt at experience, thereby limiting the ownership a given employee could feel, but it was also centered around work—trying to find time for nonwork activities, but in the context of a work-first mentality. 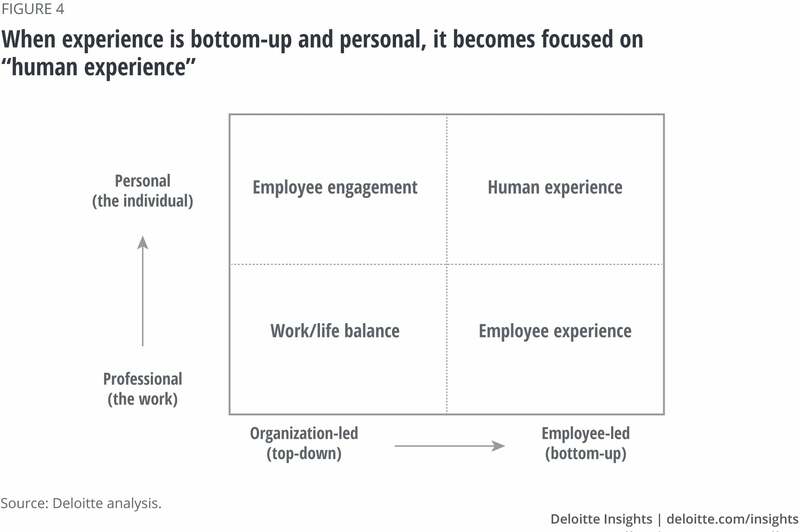 The shift from a top-down initiative to one that is bottom-up in nature came with the introduction of employee experience. Employee experience is a bottom-up concept—where processes, places, and workflow are designed around employees’ preexisting tendencies. Employee experience recognized that the employee, not the employer, must be at the center. Meaning is an aspirational driver that seeks to support others in making a difference that matters and motivates people to continue to do better. To start, it’s about more than creating a qualitative mission statement or purpose. Also, it goes beyond corporate social responsibility, and it does not necessarily equate to doing something “good” or socially desirable. It starts by asking, What are the aspirations of our customers, employees, and partners? Meaning refers to connecting work back to a deeper understanding of the participants involved—customers, workers, and other stakeholders—and the bigger impact the work will have on helping them achieve their aspirations. Wharton management professor Adam Grant found that call center employees were 171 percent more productive when they had the opportunity to spend time learning about the impact their services were having on the end customer.7 For instance, the simple act of putting a face to a name can help create meaning in an otherwise routine job. At the same time, meaning also derives from the day-to-day work: Am I using my strengths and capabilities? Am I working with people I respect to deliver something of value? To create the human experience at work warrants an end-to-end focus similar to the way organizations think about their customer experience. Traditional HR responsibilities such as hiring, onboarding, job design, rewards, and development don’t fully address issues with the work itself, which means a multifunctional focus is needed. In fact, we believe that HR organizations must partner closely with the business, IT, facilities, finance, and even marketing to make an impact in this area. While the employee experience journey may start with a focus on the workplace, perks, and rewards, in time it must focus on the more human elements of the work itself to truly create meaning. A true human experience is one that embeds meaning into work and enables every employee to contribute in the most positive, supportive, and personal way. The authors would like to thank Art Mazor and Jannine Zucker for their contributions to this chapter. ​Deloitte’s Human Capital professionals leverage research, analytics, and industry insights to help design and execute the HR, talent, leadership, organization, and change programs that enable business performance through people performance.